Tag line: "In nature, there are boundaries. One man spent the last 13 years of his life crossing them"
As much as I enjoy director Werner Herzog's dramatic films (Aguirre: The Wrath of God is one of my all-time favorites), I think I may like his documentaries a little more. In movies such as Lessons of Darkness, The White Diamond, and Encounters at the End of the World, Herzog drags his cameras to remote areas of the globe, where he researches a variety of fascinating topics. And even though he sometimes "cheats" (in interviews, Herzog admitted his 1995 TV documentary Gesualdo: Death For Five Voices was mostly fiction), he presents his material with enough sincerity to draw an audience in, telling stories that, on occasion, seem unbelievable. In his 2005 film, Grizzly Man, he relates the amazing, and ultimately tragic, tale of Timothy Treadwell. A former actor who loved the outdoors, Timothy Treadwell spent 13 summers living among the grizzly bears of Alaska's Katmai National Park. A self-proclaimed "protector" of these creatures, Treadwell shot approximately 100 hours of video footage, intended to serve as an account of his time with the bears. Over the years, Timothy was warned by the authorities that he was putting his life in danger. They told him grizzlies were powerful predators, and that, sooner or later, fate would catch up with him, which is exactly what happened on Oct. 5, 2003, when Timothy and his girlfriend, Amie Huguenard, were attacked, killed, and partially devoured by a bear. 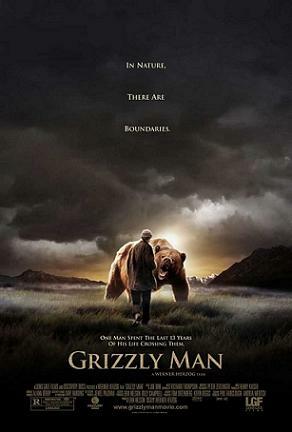 Using Treadwell's videos, as well as interviews with those closest to him, Grizzly Man explores Timothy's commitment to these animals, and how it eventually cost him his life. Herzog acts as narrator throughout Grizzly Man, his tranquil voice bringing an air of serenity to what is ultimately a very troubling tale, and, as he does with many of his documentaries, the director himself becomes part of the story. In one scene, he's sitting with Jewel Palovak, a close friend of Treadwell's who was given possession of the videotape that captured Timothy's death (because the lens cap was on at the time of the tragedy, the tape contains only the audio of the bear's attack). Palovak herself has refused to play it, but, with the cameras rolling, Herzog puts some headphones on and listens to Treadwell's final moments, telling Palovak (and us) exactly what he's hearing. Before it's done, a visibly shaken Herzog removes the headphones and tells Palovak she should destroy the tape. But the most interesting sequences in Grizzly Man feature Treadwell's own footage, during which he's talking to the bears, swimming with them, even chastising them when they get a bit too aggressive. From these scenes alone, it's obvious that Timothy Treadwell was far too trusting, and never fully realized the danger he was in. But the clips also show his devotion to these animals, and how he treasured the time he spent among them. His eyes would often tear up as he spoke of his "friends", saying, at one point, "I would die for these animals". After years of drifting aimlessly through life, Timothy Treadwell found solace among the bears of Alaska. He was, indeed, naïve (I cringed whenever he talked to these humongous creatures as if they were children), yet when the end came, he was right where he wanted to be. Yeah, I saw this about four years back. It's one of the only films I can say I really enjoyed but would never watch again just because the footage of him with the bears is so unsettling. I like what you said about him dying doing what he loved, but he was clearly not playing cards with a full deck.